Having the grandkids over is great. It can also be expensive. A trip to the movies for a family of four can easily set you back $80 or more after the tickets and snacks. Entrance fees to water parks and amusement parks are just as expensive, and even a meal at a local restaurant can empty your wallet. 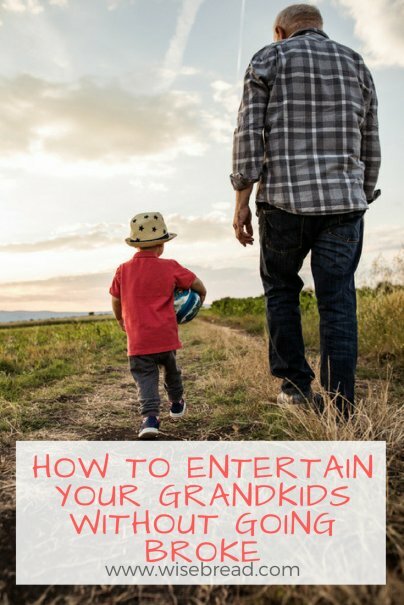 But if you get creative, you can give the grandkids a great time without fretting about the cost. There's always an outcry from a select set of people when you mention McDonald's. Whatever you think of the golden arches franchise, it's hard to deny the convenience and wonder of the PlayPlace. It's completely free, it's well-maintained, and the kids love it. It's bright, it's full of other excited kids, and grandparents can watch the grandkids from a comfy bench. You don't even have to order a meal to access it. Split a coffee or bottle of water and watch the kids have a blast. Most suburban housing areas have a Homeowners' Association (HOA) that takes care of garbage, snow removal, and the upkeep of a safe, secure playground. They usually have some kind of climbing frame, swings, monkey bars, and lots of room to play. You can often find several of these playgrounds within a few minutes' drive from each other, so take the kids on a kind of playground treasure hunt. Drive around the neighborhoods, and when they find a park they like, go play! There are usually benches right there at the park for the parents and grandparents to take a load off while the kids run around. Hardware stores know that by offering these free crafts for the kids, the parents will visit the store and end up making a purchase. But you don't have to buy anything. Simply visit your nearest Home Depot or Lowe's when they next have a kid's craft session, and watch the grandkids have an awesome time assembling a bird feeder, or wooden car, or play with sand and special tools. Whatever the grandkids make, they get to keep and bring home. It's a fun, free activity that takes up a few hours, usually on a Saturday morning. Free summer concerts are usually hosted by counties looking to help increase trade at malls, farmers markets, or other shopping venues, and it works. People come out for the free music, and spend money on food trucks, toys, rides, and more. Again, you don't have to spend any money if you don't want to. Get online and search for "free concerts near me" and just watch the results come flooding in. They're usually outdoor, rain-or-shine events, and you will have to provide your own seats and blankets. But it's a great way to spend a few hours watching the grandkids dance and have fun, while getting involved in something positive for your community. Bowling centers in towns and cities all across America are participating in a program called Kids Bowl Free. Register your grandkids and they will each receive two free games of bowling each day over the summer, a giveaway valued at over $500 per child. Find out which centers near you are involved in the initiative. If you want to join in, many bowling centers offer discounted rates for seniors, and you can also find great deals on sites like Groupon and LivingSocial. Kids spend way too much time indoors these days, so get them outside to a local park for a family picnic. You don't have to do anything fancy, all you need are a few blankets, folding chairs, some snacks, and maybe a few balls and Frisbees for the kids to throw around. Kids hear the word "museum" and they think of dusty sculptures, old paintings, and tired fossils. However, modern museums are jam-packed with the most incredible interactive exhibits, often showcasing great pop culture events. The recent Star Wars and the Power of Costume traveling exhibit from the Smithsonian was a smash hit, and kids everywhere flocked to the museums with their parents and grandparents. While you're out in the garden, if it's a nice sunny day and the watering restrictions in your area allow it, get the sprinklers going. The grandkids can put on their swimsuits and run around in the water for hours. You can find cheap attachments at most major stores for hoses that are specifically designed to sprinkle out water in fun patterns, and you can also pick up a Slip 'n' Slide for about $20. Make a kite, and then go and fly it with the grandkids. There are instructions online for many different types of kites that you can make for pennies, using items you'll find around the house, or, you can pick up cool and colorful kites for $10-$20. Then, go to a local park or a place that has plenty of space, and watch the grandkids go berserk when the kite hits new heights.